A dilettante at heart, Morning Glory Blade became a bard because it seemed the easiest way to make a living in the world. Often she would trade a smile and a song for a soft bed, tasty meal, or a shiny coin. What could be better? She began her career by performing in small thorps, hamlets, and villages. The locals welcomed a talented bard. She traveled on foot between these rural settlements and often took off-the-road shortcuts through woods or fields. One day, deep in a wood, Morning Glory caught a glimpse of a beautiful woman seated before a mirror-surfaced pond beneath a large oak tree. No stranger to stories of fey since she had sung numerous songs about them, the bard yearned to talk to the lovely dryad, but she feared that approaching closer might frighten the fey woman away. Morning Glory stayed very still and started singing a sweet country air. Like a startled deer, the fey looked up with muscles tensing, preparing to flee. The beauty of the song, however, soothed her and listened raptly. When Morning Glory finished the song, and the last tone died away, the fey whispered: "Come with me." The dryad took the bard to the realms of the faerie to play before the Dawn King and the Queen of Air and Darkness in the Great Hall of their castle. Fair though Morning Glory's performance for the dryad might have been, the bard outstripped it as she sang the classic ballad "The Death of Spring." All eyes turned to the Queen as the bard finished. "Play on," said the Queen. Morning Glory sang and sang and recited and sang some more. Glistening water nereids wept at a tale of shipwreck. The Queen laughed as the bard led some of the assembled pixies and grigs in a comic round. When Morning Glory finished one ballad, she started another. An epic poem, a sweet lullaby, a rousing battle tune followed one after the other as water down a stream. The fey enjoyed themselves and applauded loudly once their dark queen indicated her approval of each piece. The next thing that Morning Glory remembers is waking under the tree, beside the pool, in the cold dawn, filled with an eternal longing to return to the fey realms. Morning Glory Blade: Female elf Brd 6; CR 6; Medium-size humanoid; HD 6d6; hp 21; Init +3; Spd 30 ft.; AC 14, touch 14, flat-footed 11; Atk +6 melee (1d8+2/19-20, +1 longsword), or +9 ranged (1d8+1/x3, masterwork mighty composite longbow [+1 Str bonus] with masterwork arrows); SQ bardic knowledge +6, bardic music (countersong, fascinate, inspire competence, inspire courage, suggestion) 6/day, elf traits; AL NG; SV Fort +2, Ref +8, Will +4; Str 13, Dex 16, Con 10, Int 10, Wis 8, Cha 16. Skills and Feats: Diplomacy +12, Knowledge (history) +9, Knowledge (nobility and royalty) +9, Listen +1, Perform (singing, dancing, lute, panpipes, lyre, drum, drama, mime, juggling) +12, Search +2, Spot +1; Dodge, Mobility, Spring Attack. Bardic Knowledge: Morning Glory Blade can make a bardic knowledge check with a bonus of +6 to see whether she knows some relevant information about local notable people, legendary items, or noteworthy places. Bardic Music: Morning Glory Blade can use her song or poetics to produce magical effects on those around her. Countersong (Su): Morning Glory Blade can counter magical effects that depend on sound by making a Perform check for each round of countersong. Any creature within 30 feet of her that is affected by a sonic or language-dependent magical attack can use Morning Glory Blade's Perform check result in place of his or her saving throw if desired. Countersong lasts for 10 rounds. Fascinate (Sp): Morning Glory Blade can cause a single creature within 90 feet that can see and hear her to become fascinated with her. Morning Glory Blade's Perform check result is the DC for the opponent's Will save. Any obvious threat breaks the effect. Fascination lasts 6 rounds. Inspire Competence (Su): An ally within 30 feet who can see and hear Morning Glory Blade gets a +2 competence bonus on skill checks with a particular skill for as long as he or she can hear the music. Inspire Courage (Su): Allies who can hear Morning Glory Blade receive a +2 morale bonus to saves against charm and fear effects and a +1 morale bonus to attack and weapon damage rolls. The effect lasts for 5 rounds after the ally can no longer hear her. Suggestion (Sp): Morning Glory Blade can make a suggestion (as the spell) to a creature she has already fascinated. A Will save (DC 16) negates the effect. Elf Traits: Morning Glory Blade is immune to magic sleep spells and effects. She has a +2 racial bonus on saves against enchantment spells or effects. She also has low- light vision (can see twice as far as a human in low-light conditions) and is entitled to a Search check when within 5 feet of a secret or concealed door as though actively looking for it. As an elf, she has Martial Weapon Proficiency (composite longbow, composite shortbow, longbow, longsword, and rapier) as bonus feats. Morning Glory Blade also has a +2 racial bonus on Listen, Spot, and Search checks (already figured into the statistics given above). Bard Spells Known (3/4/3; save DC 13 + spell level): 0 -- detect magic, flare, ghost sound, open/close, read magic, resistance; 1st -- charm person, cure light wounds, identify, mage armor; 2nd -- blur, silence, sound burst. Possessions: Ring of protection +1, +1 longsword, masterwork mighty (+1 Str bonus) composite longbow, 25 masterwork arrows, potion of jump, potion of spider climb, potion of invisibility, lute, 100 gp pearls (2). Seeing the glorious splendor of the fey realms made the mortal world seem drab to Morning Glory. The bard sought to live fully and make deeds worthy of song -- songs she hoped to someday sing at the court of the Queen of Air and Darkness. 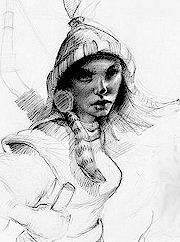 She traveled extensively on roads fraught with danger where her bow and sword were never far from hand. She handled herself well in a fight. Many is the base brigand that didn't live long enough to regret his choice of target. She freelanced for various adventuring parties, helping one group kill a dragon and another destroy a lich's phylactery. Recently, a lawful good group known as "The Holy" asked her to help them find a legendary rod known as Dark Fate. Morning Glory Blade: Female elf Brd 9; CR 9; Medium-size humanoid; HD 9d6; hp 31; Init +3; Spd 30 ft.; AC 14, touch 14, flat-footed 11; Atk +8/ +3 melee (1d8+2/19-20, +1 longsword); or +11/+6 ranged (1d8+1/x3, masterwork mighty composite longbow [+1 Str bonus] with masterwork arrows); SQ bardic knowledge +9, bardic music (countersong, fascinate, inspire competence, inspire courage, inspire greatness, suggestion) 9/ day, elf traits; AL NG; SV Fort +3, Ref +9, Will +5; Str 13, Dex 16, Con 10, Int 10, Wis 8, Cha 19. Skills and Feats: Diplomacy +16, Knowledge (history) +12, Knowledge (nobility and royalty) +12, Listen +1, Perform (singing, dancing, lute, panpipes, lyre, drum, drama, mime, juggling) +16, Search +2, Spot +1; Dodge, Mobility, Point Blank Shot, Spring Attack. Bardic Knowledge: Morning Glory Blade can make a bardic knowledge check with a bonus of +9 to see whether she knows some relevant information about local notable people, legendary items, or noteworthy places. Bardic Music: Blade can use her song or poetics to produce magical effects on those around her. Fascinate (Sp): Morning Glory Blade can cause a single creature within 90 feet that can see and hear her to become fascinated with her. Morning Glory Blade's Perform check result is the DC for the opponent's Will save. Any obvious threat breaks the effect. Fascination lasts 9 rounds. Inspire Greatness (Su): After hearing Morning Glory Blade sing for a full round, a creature within 30 feet gains +2 Hit Dice (d10s that grant temporary hit points), a +2 competence bonus on attacks, and a +1 competence bonus on Fortitude saves. The effect lasts until 5 rounds after the creature can no longer hear her. Suggestion (Sp): Morning Glory Blade can make a suggestion (as the spell) to a creature she has already fascinated. A Will save (DC 17) negates the effect. Bard Spells Known (3/4/4/3; save DC 14 + spell level): 0 -- detect magic, flare, ghost sound, open/close, read magic, resistance; 1st -- charm person, cure light wounds, identify, mage armor; 2nd -- blur, silence, sound burst, tongues; 3rd -- confusion, dispel magic, keen edge. Possessions: Ring of protection +1, +1 longsword, masterwork mighty composite longbow (+1 Str bonus), 25 masterwork arrows, cloak of Charisma +2, Heward's handy haversack, potion of jump, potion of spider climb, potion of invisibility, acid (flask) (2), alchemist's fire (2), antitoxin (vial) (2), holy water (flask) (2), smokestick (2), sunrod (2), tanglefoot bag (2), thunderstone (2), tindertwigs (2), lute, 100 gp pearls (2). The rod called Dark Fate was in a long-abandoned drow crypt now inhabited by driders and their pet monstrous spiders. Things went poorly for the group as they attacked. The spider's poison affected more than one party member, including Morning Glory, and the group's leader called for a retreat. Unable to carry off all the wounded, one group member took a hair from what he believed to be Morning Glory's dead body, and left it, with plans to resurrect her once they got back to town. The bard was not dead, only dying. The driders stabilized her and went to work transforming her into one of them. Now Morning Glory Blade is an angry drider, and she is filled with loathing for the mortal world, though she especially hates her former friends from "the Holy." She plans to try to find the rod, Dark Fate, on her own and use it to wreak her vengeance. Morning Glory Blade: Female drider* Brd 9; CR 11; Large aberration; HD 9d6+36; hp 31; Init +4; Spd 30 ft., climb 15 ft.; AC 20, touch 14, flat- footed 16; Atk +8 melee (1d4+4 plus poison, bite), or +9/+4 melee (1d8+4/19-20, +1 longsword) and +3 melee (1d4+1, bite), or +11/+6 ranged (1d8+3/x3, masterwork mighty composite longbow [+3 Str bonus] with masterwork arrows); Face/Reach 10 ft. by 10 ft./5 ft.; SA poison, spell-like abilities; SQ bardic knowledge +9, bardic music (countersong, fascinate, inspire competence, inspire courage, inspire greatness, suggestion) 9/ day, elf traits, SR 20; AL CE; SV Fort +7, Ref +10, Will +6; Str 17, Dex 18, Con 18, Int 10, Wis 10, Cha 21. Skills and Feats: Climb +11, Diplomacy +17, Hide +4, Knowledge (history) +12, Knowledge (nobility and royalty) +12, Listen +2, Move Silently +8, Perform (singing, dancing, lute, panpipes, lyre, drum, drama, mime, juggling) +17, Search +2, Spot +2; Dodge, Mobility, Point Blank Shot, Spring Attack. Poison (Ex): Morning Glory Blade delivers her poison (Fort DC 14) via each successful bite attack. The initial damage and secondary damage are the same (1d6 points of temporary Strength damage). Spell-Like Abilities: 1/day -- dancing lights, darkness, detect chaos, detect evil, detect good, detect law, detect magic, faerie fire, levitate. Caster level 1st; save DC 15 + spell level. Fascinate (Su): Morning Glory Blade can cause a single creature within 90 feet that can see and hear her to become fascinated with her. Morning Glory Blade's Perform check result is the DC for the opponent's Will save. Any obvious threat breaks the effect. Fascination lasts 9 rounds. Suggestion (Sp): Morning Glory Blade can make a suggestion (as the spell) to a creature she has already fascinated. A Will save (DC 18) negates the effect. Bard Spells Known (3/5/4/3; save DC 15 + spell level): 0 -- detect magic, flare, ghost sound, open/close, read magic, resistance; 1st -- charm person, cure light wounds, identify, mage armor; 2nd -- blur, silence, sound burst, tongues; 3rd -- confusion, dispel magic, keen edge. Possessions: Ring of protection +1, +1 longsword, masterwork mighty composite longbow (+3 Str bonus), 25 masterwork arrows, cloak of Charisma +2, necklace of fireballs (Type VII), Heward's handy haversack, potion of jump, potion of spider climb, potion of invisibility, acid (flask) (2), alchemist's fire (2), antitoxin (vial) (2), holy water (flask) (2), smokestick (2), sunrod (2), tanglefoot bag (2), thunderstone (2), tindertwigs (2), 100 gp pearls (2). * Uses the Monster Mayhem drider template found on the Wizard's website. Gwendolyn F. M. Kestrel is an editor for Wizards of the Coast's Roleplaying Games R&D department. Recent credits include editing Faiths and Pantheons, Oriental Adventures, and Magic of Faerûn, and designing part of the Book of Challenges. She's a frequent contributor to the Dungeons & Dragons website. Also, check out the website she created for her husband, game designer Andy Collins.